Modified ILLUSTRIOUS-Class Fleet Aircraft Carrier ordered under the 1937 Estimates from Vickers Armstrong, Barrow in Furness on 6th July 1937. The ship was laid down on 10th November that year and launched on 26th March 1940 as the 3rd RN Warship to carry the name. It had previously been used by a battlecruiser sold in 1921. She was completed in 1941 and, after a successful WARSHIP WEEK National Savings campaign in March 1942, was adopted by the civil community of Belfast. Yard No on build was 735. June Contractors trials and commissioning. to October Nominated for deployment in Far East with Force Z. Passage to West Indies to work-up for operational service. 3rd Ran aground during work-up in West Indies and departure for Trincomalee delayed. Took passage to Norfolk, Va for repair. HM Battleship PRINCE OF WALES and HM Battlecruiser REPULSE in Force Z. HUNTING OF FORCE Z by R Hough and Naval Staff History). December Passage to join Eastern Fleet in Ceylon. Passage to East Indies escorted by HM Destroyers NAPIER, NIZAM and NESTOR. 27th Flew off Hurricanes south of Sumatra for use at Batavia. February Passage to Trincomalee to refuel. reinforce existing air defence resources. Re-embarked own aircraft. Passage to Addu Atoll for flying training and work-up for operations. aircraft carrier force reported as bound for an attack on Ceylon. 5th Sailed with Force A to intercept Japanese ships without success. PACIFIC by E Walker and ENGAGE THE ENEMY MORE CLOSELY by C Barnett). 8th Returned to Addu Atoll. Took passage to Bombay with Force A. 22nd Nominated for support of allied landings in Madagascar (Operation IRONCLAD). (For details of naval activities in Indian Ocean during 1941 and 1942 see above references). 3rd Joined Convoys Y and Z off Madagascar. 5th Deployed with HMS ILLUSTRIOUS and provided air cover for assault landings. to Launched attacks in support of shore operations. 7th (For details see RELUCTANT ENEMIES by W Tute and Naval Staff History). 8th Under torpedo attack by Vichy French submarine MONGE which failed. Submarine was sunk by depth charges from HM Destroyers ACTIVE and PANTHER. Exercised with HM Battleship VALIANT off Mombasa. July Transferred to Gibraltar for duty with Force H and took passage. Atlantic for joint exercises in multi-carrier operations and fighter direction. (Exercise BERSERK - See RADAR AT SEA). 10th Part of Force Z covering passage of military convoy (WS21S) to Malta. and ship returned to Gibraltar. BATTLE FOR THE MEDITERRANEAN by D MacIntyre and Naval Staff History). September Passage to USA for repair and refit. radar displays and radio telephone equipment for fighter direction. (For details of development and use of radar in RN see RADAR AT SEA by D Howse). April Deployed with Home Fleet. to May Carried out trials with new radar equipments (See RADAR AT SEA). 17th Joined Force H at Scapa Flow for duty in Mediterranean and took passage to Oran. five destroyers to cover military convoys to Central Mediterranean. during landings in Sicily (Operation HUSKY). 31st Arrived at Norfolk Navy Yard, Virginia. September Under repair and refit. to December American Radar Types SM1 and SG fitted. (See RADAR AT SEA). May Completed refit and returned to UK to embark aircraft. 5th Joined Eastern Fleet with HM Aircraft Carrier VICTORIOUS. Prepared for operational duties with Fleet. Bomber Command on Sumatra (Operation BOOMERANG). (For details of Eastern Fleet operations see OPERATION PACIFIC). over Nicobar Islands (Operation LIGHT). US landings on Leyte (Operation MILLET). Six aircrew were lost. 17th Launched air attacks with HMS VICTORIOUS on Nicobar Islands. HM Cruiser PHOEBE provided fighter direction facilities and AA defence. Group was screened by HM Destroyers WHELP, WAKEFUL, WAGER and WESSEX. 19th Repeated air attacks on Nicobars. 20th Deployed with HMS ILLUSTRIOUS to launch air attacks on Belawan Deli. WESSEX and WAKEFUL. (Operation OUTFLANK). 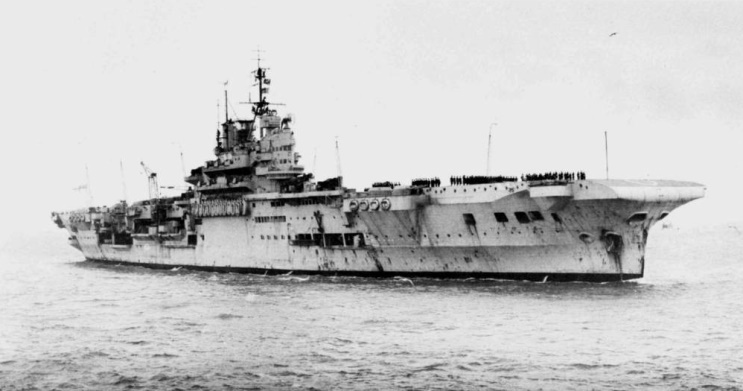 22th Became part of British Pacific Fleet with HMS ILLUSTRIOUS and HMS VICTORIOUS. (For details see TASK FORCE 57 by P Smith and CARRIER VICTORY by JM Ludley). January Joined Task Force 63.
mentioned in the report on this operation). of British Pacific Fleet for service in Pacific area. at Lembak and Tanglangbetoetoe (Operation MERIDIAN TWO). executed by the Japanese in August 1945. (Operation MERIDIAN TWO). 4th Arrived Fremantle with British Pacific Fleet. 9th Arrived at Sydney to prepare for operational service as TF113 with US Navy. March Re-designated as part of Task Force 57. US landings on Okinawa until 7th April (Operation ICEBERG). started. Flight deck was cleared and fires extinguished with an hour. 9th Flying operations transferred to targets in Formosa (Operation ICEBERG OOLONG). 11th With HMS INDEFATIGABLE carried attacks on Schinchiku and Matsugama. 16th Transferred with TF57 to renew attacks on airfields in Ishigaki and Miyako in Sakishimas. 1st Sailed from Leyte to resume attacks on Sakishima Gunto group. Hit by KAMIKAZE aircraft but remained operational. 20th In collision with HM Destroyer QUILLIAM which was seriously damaged. 25th Sailed for Manus on completion of operation requirement for TF57. June Relieved by HM Aircraft Carrier IMPLACABLE and refitted in SYDNEY. July On completion remained at Sydney. 15th Transferred to RN control after Japan surrendered. Task Group 111.2 to re-occupy Hong Kong. Colony of Hong Kong after minesweeping completed. 30th Carried cut air attacks with HMS VENERABLE on Japanese explosive boats in Lamma Bay. Entered Hong Kong on completion. HMS INDOMITABLE was deployed with the BPF in the Far East until 12th November 1945 and returned to the United Kingdom on 12th December. The ship was reduced to Reserve in 1946. Between 1948 and 1950 she was extensively refitted and modernised including replacement of bow and stem structure as well as installation of British radars. On completion she re-commissioned and was deployed as Flagship of the Home Fleet. In 1954 she was again put in Reserve and then placed on the Disposal List. On 30th September 1955 this ship arrived at Faslane to be broken-up. While all of this was going on (the career at that time of Illustrious and Formidable, followed by them returning across the Atlantic to the UK and being in collision on the 16 December), HMS Indomitable was commissioned on 26 August 1941. She underwent further refitting until late September. On 1 October she embarked her first aircraft and sailed to conduct flying trials. On 18 October she sailed for Bermuda, travelling in convoy part of the way. She reached Bermuda on 27 October. On 31 October she sailed for Jamaica. On 3 November while entering Kingston she ran aground on a pinnacle rock when she departed from the marked channel. She did not get off until the next day and did so with substantial damage to her hull forward. On 6 November she departed for Norfolk, arriving on 10 November. During the next 11 days the US repair facilities fitted her with a new bow. She departed Norfolk on 21 November, and after a brief trial run, sailed for Jamaica, arriving on 25 November. She then began her work up period, which was completed on 17 December, after which she departed for the Far East, making Capetown on 2 January and Aden on 11 January. After that she made two voyages to the Dutch East Indies/Ceylon with RAF Hurricanes before joining the Eastern Fleet. The ship was carrying out exercises off Malta. I was Deck Landing Control Officer at the time ,and on the flight deck this day, when I heard a rumbling thump and the ship shook. Immediately thick black smoke started pouring out of the starboard side. Cause - an Avgas [aviation petrol] leak had developed in an area below decks. The Damage Control Head Quarters [DCHQ] personnel had shut off that part of the system but not as quickly as possible because, it was discovered later, the builders drawings of the fuel system had an error in them. Our planeguard destroyer came up abeam and offered assistance but our crew managed to control and extinguish the flames, after what seemed like ages. The situation was not helped by the fact that DCHQ itself was near the seat of the explosion and filled with smoke. The subsequent enquiry determined that the cause was as follows. When the leak was discovered Emergency Damage Control State 1 was broadcast throughout the ship. This meant that every watertight door and hatch in the ship was shut and fully clipped. This was followed by DCHQ shutting down all electrical ventilation fans, to stop vapour being spread. Avgas had flowed though some areas but petrol vapour had drifted down to the deck below the leak. When fans are shut down arcing can occur in the electric motor and this caused the vapour to explode, which then ignited the liquid. On examining the area afterwards I was amazed at the power of the explosion. The site was in a passage with the hangar on one side and armour plate of the ships side on the other. Three fully clipped heavy water tight doors had been blown completely out, one after the other. Royal Navy carriers have sealed aircraft hangars, with double door air locks for access; the nearest withstood the explosion but only just. The outer door went but the inner one held, although damaged. One person was killed in the airlock. If the air lock had failed we could have lost the ship. Later, we flew off all serviceable aircraft to RNAS Hal Far and we entered Grand Harbour for repairs and nine funerals. Two George Medals and six other awards for bravery were gazetted later. About a year later I found a Readers Digest which listed a series of violent incidents caused by 'world saboteurs' and Indomitable was included. Never bought a copy after that.